inventory on your Android phone or tablet. * Install the utility from the Android market. * Copy your inventory file to the device's SD card. 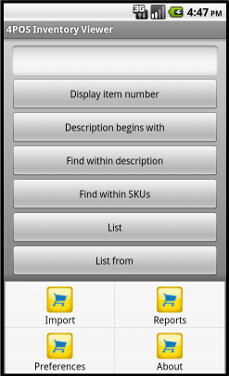 Install the utility from the Android market (4POS Inventory Viewer). Copy the inventory file (film.dat) from your 4POS installation (C:\4POS or C:\4PSV by default) to the device SD card. From the viewer utility, open the options menu and click Import. Select the inventory file on the SD card. The program requires Android 2.2 or later.